← Sunday 7th June 2015 – Sunday on the allotment. Tuesday 9th June 2015 – Rhubarb, Rhubarb!! What is the best medicine for a migraine (apart from my wacky pills as I call them)? The answer …… going to the allotment. The one I had in the early hours of this morning, 2am to be exact, was not one that I would like to repeat again. I have known nothing like that before. Let’s just say I wanted to cut open my head and take out my brain!! But that’s enough talk of that, let’s get down to business. I took it fairly easy on the allotment today as it was still niggling so I planted the following: French Beans – I had put up, a few days beforehand 26 poles and that was just perfect for the amount of beans I needed to get in. I started my beans off in 3 inch pots and planted I think 3 beans in each pot. About half had germinated so in some pots I had 1 plant and then in others I had 3 plants. I didn’t separate them out, I just planted them as they were. I also planted out 5 Pumpkin plants. These were from seeds that I’d saved from last year, so they could be any variety, I’ll just have to wait and see. I then planted out 18 Sprouting Broccoli plants. Make sure you protect them from below and above. But they will give you an ample supply of sprouts early next year. Then finally before I left to come home I harvested a load of Rhubarb. Once I’d harvested what I needed, I then weeded their bed. I’ve got lots of Rhubarb and am looking for something different to do with it. So if you have any suggestions please feel free to mention them. Fresh ideas on what I can do with this please….nothing rude though! It was then home to have a sit down before the kids came home from school. Hopefully I won’t ever get another migraine like that again. If I had to score it from 1 (lowest) to 10 (really bad), I’d put it at 11!! No kidding!! This entry was posted in Uncategorized and tagged Broccoli spring sprouting, claire's allotment, french beans, pumpkins, rhubarb. Bookmark the permalink. 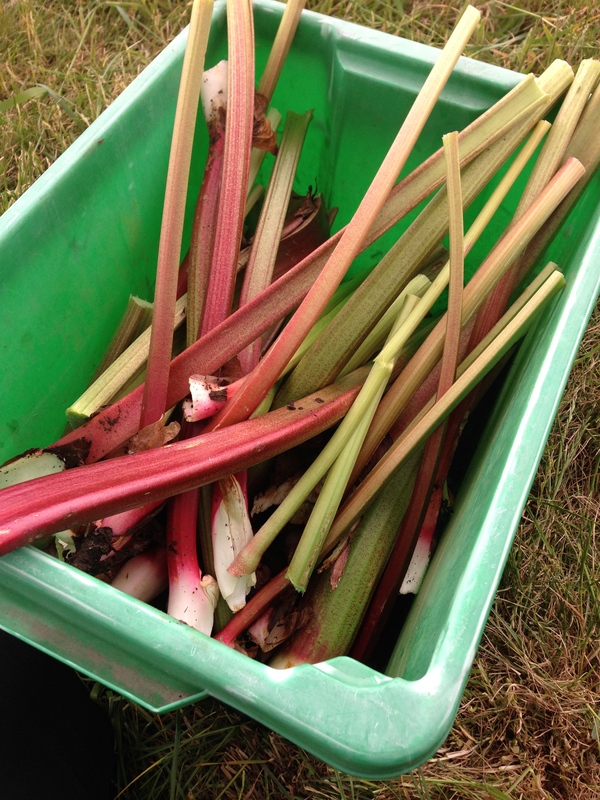 4 Responses to Tuesday 9th June 2015 – Rhubarb, Rhubarb!! Never heard it call “bad head crumble” before. I love it!! I like the idea of the cake. I’ve made wine before and it was very nice, but I just don’t think I have the time to do it at the moment. Need more hours in the day!! Wipe, chop and freeze the rhubarb then defrost in a very clean bucket and mix in 3lb sugar. The next day, add 250g chopped sultanas (not raisins unless you want brown wine) and pour over 2 pints of boiling water. Stir to dissolve the sugar, cover and allow to cool. Then add another 6 pints of cold water, a sachet of wine yeast and a teaspoon of yeast nutrient (try Wilkos or a local homebrew shop for these). Stir daily for 3 days then strain through muslin into a demijohn with airlock, or one of those big 5 litre bottles of water you can buy from the supermarket, covering the opening with clingfilm to allow CO2 to escape but prevent air from entering. Put in a coolish dark place or cover with a dark bag so light doesn’t ruin the colour and ignore till it stops bubbling and the sediment drops to the bottom. Adding 200g raspberries along with the sultanas makes it even better! Oh wow!! That sounds amazing!! I must give that a go.